I enjoy painting fantasy art, going to art shows, creating delicious dishes, being with my grandkids, taking walks, and reading good books. 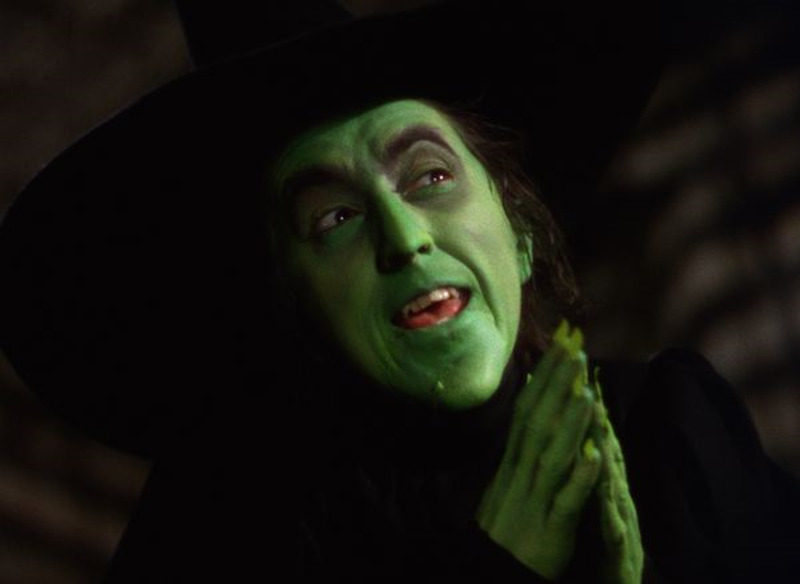 Are you invited to a Halloween party at the last minute and don't know what to wear? Or are you busy like we are and don't have time to sew up an elaborate costume for Halloween this year? 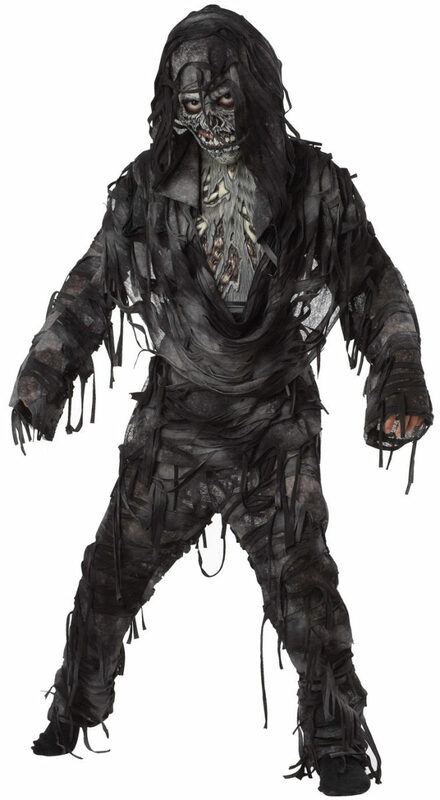 If you are like me, than I want to put together a fun costume that is easy and doesn't cost a lot of money. A Pirate costume for both men and women (and even kids) is just the thing. 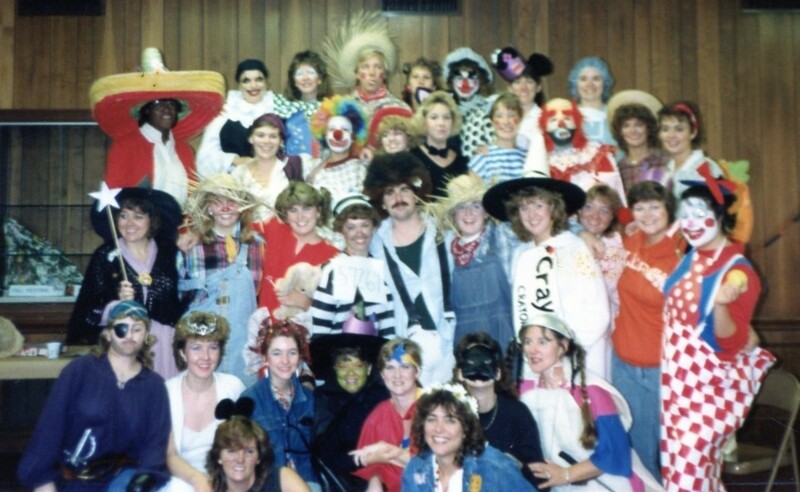 My birthday falls just days before Halloween and we like to go out to a costume party to celebrate. It is our special thing to do each year. 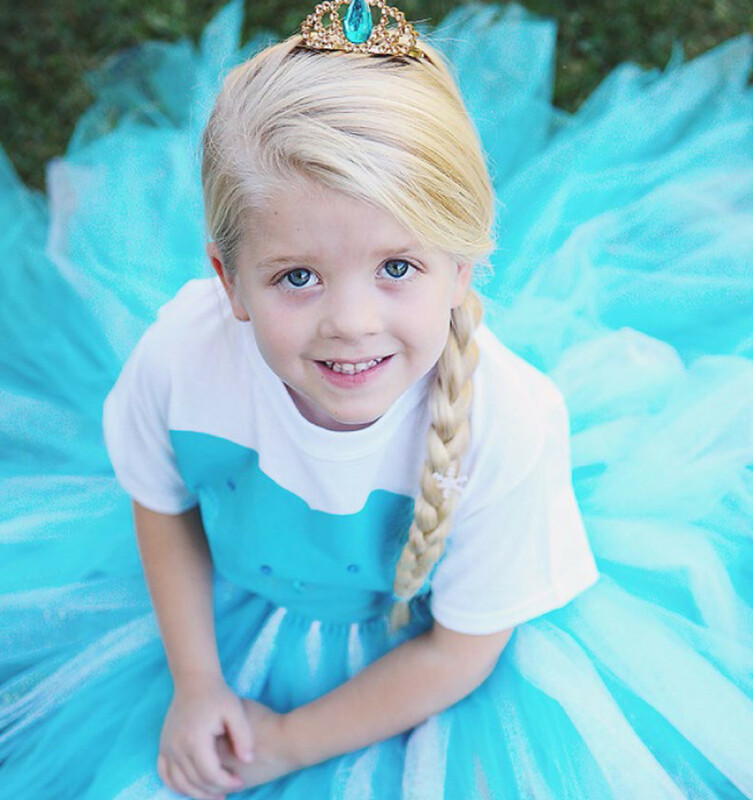 But with our busy schedules of work, school, family and home, we need a costume that is easy to put together. 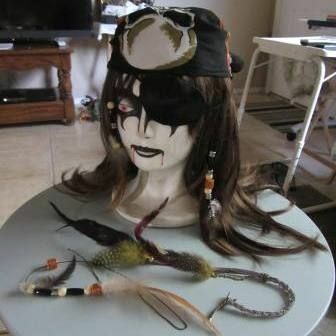 Several years ago with the popularity of the Jack Sparrow movies, we created this pirate costume complete with the feathers and beads in the hair. My boyfriend has worn this costume each year since. It is hanging in the closet and ready to wear. 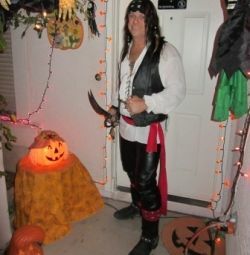 I created my own pirate costume this past Halloween with items from my closet, from my sister's closet and the second-hand store in the neighborhood. I added accessories from the local party store and the costume is done. Just that easy! What I like about being a pirate for Halloween is that each pirate costume I have seen at the parties is unique to each person's personality. Learn to Create Your Own Pirate Character! All Pirates have their own unique personality and style. What is your inner pirate? Do You Have Pirate Clothing in Your Closet? When I needed to put a Halloween costume together on short notice for my boyfriend and myself, I headed straight of my closet. 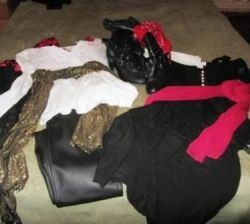 I was surprised to find so many more usable clothing items than I expected to create a pirate costume. 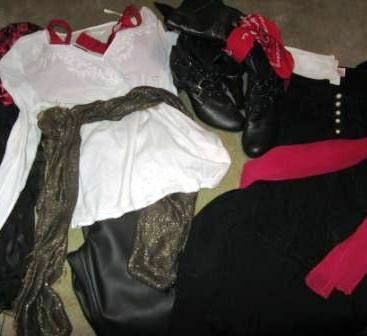 With a little imagination and a bit of creativity, you can turn black or brown pants, black skirts, black, white or red long-sleeve shirts and lots of belts, scarves and bandanas into a pretty cool-looking pirate costume. Plus I am pretty sure everyone will have a pair of black or brown boots in their closet as well. If you need some help putting this costume together, look for some pictures of pirates or watch a pirate movie or two for ideas. That really helped us, especially watching the Pirates of the Caribbean with Johnny Depp. We took the Jack Sparrow character and created a similar look for Jay. I just put together an outfit that worked for my "pirate persona". I wore a black skirt with an uneven hemline, black boots, black top and lots of accessories to complete my look. Pulling together a pirate costume for my man was fairly easy. We picked up a peasant shirt with laces a few years back which is perfect for a pirate shirt. 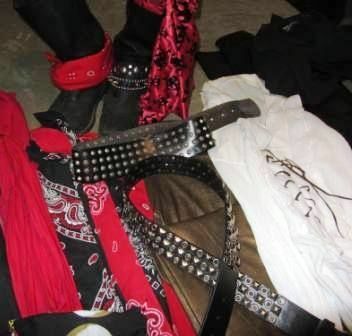 He owns a black leather vest, pants, boots and belts for when he sings in a rock band so those items were added to the pirate costume. If you don't happen to be or live with a rock singer, then any black or dark brown pants will do. I think the black boots do make the look along with lots of belts and bandanas or scarves tied everywhere. 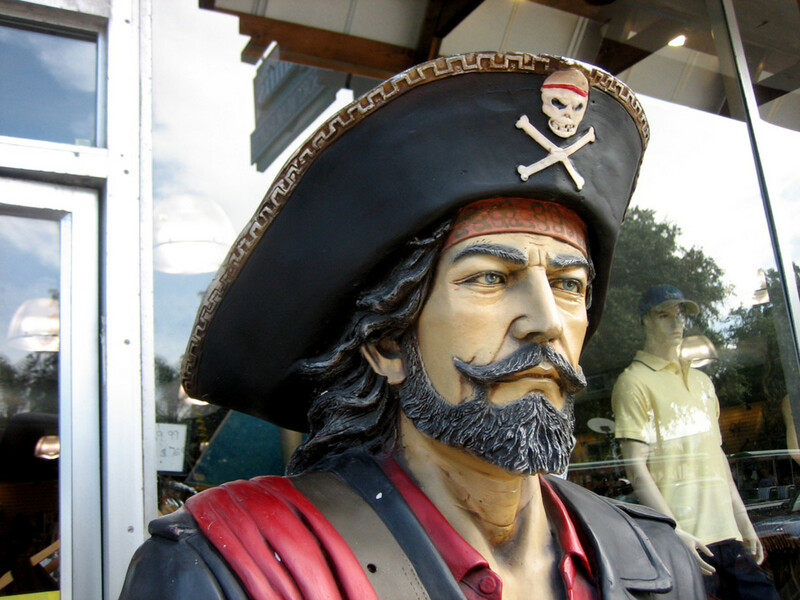 Loose fitting shirts, pants, vests and jackets are a great pirate look for men. In the photos or movies I see with pirates, they all seem to where lots of layers and mismatched to boot. Don't worry about if everything coordinates together, if it doesn't that is even better. Men, if you don't have pierced ears they do make costume clip hoop earrings. Find lots of costume rings and necklaces to finish off your outfit. I recommend pulling everything that might work for a pirate costume out of your closet and put on your bed like I did in this photo. Try things together and try it all on to find the right look for you. I have a couple different pirate outfits in my closet to decide between. Last year I wore the black skirt which as an uneven hem, black peasant top, my black boots with buckles, and lots of scarves and bandanas. I even picked up a pair of red and white stockings to complete the look I was going for. I had all these items except the stockings in my closet. The other costume I put together for a pirate adventure is a pair of black leather pants, a white gauze peasant blouse, bronze scarf to use as a belt and my other black boots with ties. I add all the jewelry I can get on me to add lots of sparkle to my pirate look. I wore a long, dark brown wig with a scarf tied around my head to the Halloween party. What to Put on Top of Your Pirate's Head? If you hadn't noticed, pirates always have something on their head. Usually it is a leather hat, but if you don't have one a bandana will work just as well. We have lots of colored bandannas and scarves to tie around our head. I also have a dark brown wig ready for when I want a different look. We add dark brown hair extensions to Jay's hair make his hair a lot longer. Hair extensions would work for ladies too! I made feather and beads for our hair. I attach them on with the hair extension clips underneath our real hair. Once the added beads and feathers are in place than I put on a bandanna to hold it all in place. We personally don't wear Pirate hats, but I am thinking about investing in a nice leather looking pirate hat for a future pirate costume. That is what is fun about creating pirate costumes is that you can look different each time you wear one to the next Halloween party. 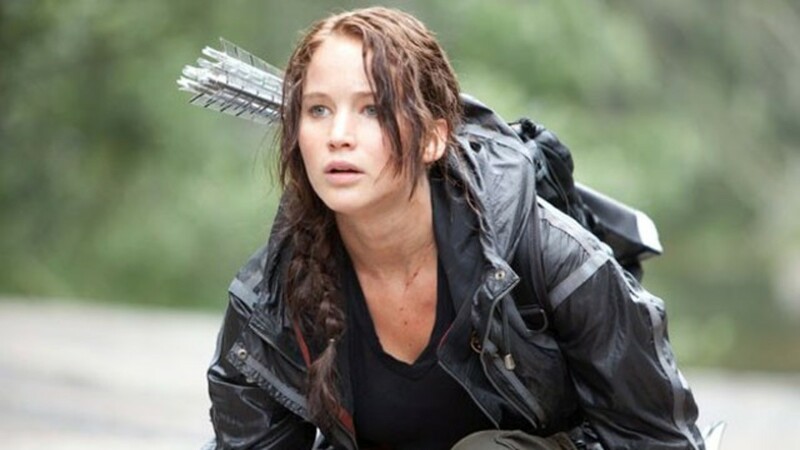 I know I keep referring to the character "Jack Sparrow", but there are so many great costume ideas by studying this character. Putting feathers and bead in our hair was another great idea to add to the look we are going for. 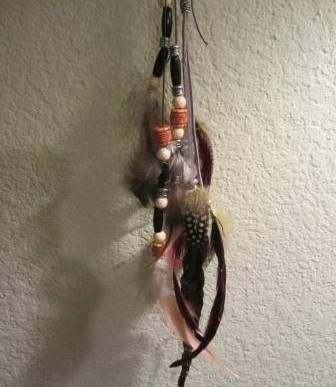 I found putting together feathers and beads on a thin leather cord was quick and easy. I went to a couple local craft and hobby stores and picked up the supplies I needed to make several each of us. I was able to make them in an afternoon. I attach them with clips from the local beauty supply store. Let your inner creativity go and create your own designs using your favorite colors! More is more when creating a pirate character. Cut the thin cord into 18" lengths. I cut six pieces so I had enough for two pirates. I start with threading a bead on the cord and inserting a feather into the bead. I tie off them both and this becomes the bottom. Then add several different colors and styles of beads on to the cord. The next bead I will add another feather and tie off. Repeat this step at least one more time so you have at least 3 feathers with beads on the end of the cords. Tie off a 1" to 2" loop at the top for the clip that will hold it in your hair. I leave one at full 18" in length so it is at least hanging to below my chin from the top of my head. The I cut the others into several different lengths so they don't all hang evenly in your hair. I use the clips from the beauty supply store to hold these feathered beads in our hair. 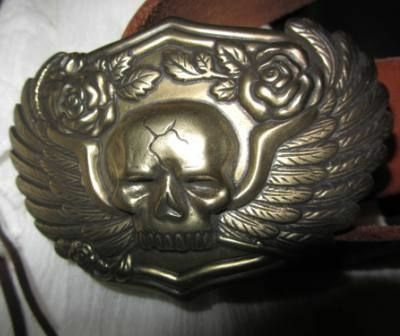 I just clip underneath a section of hair on the top or side of our head where it will be covered by a bandana or hat. Did I mention accessories? A pirate cannot have enough bling. 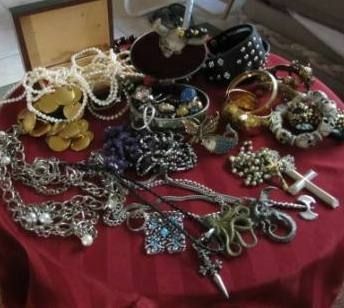 Once the pirate costume and clothing is put together, don't forget the rings, earrings, chains, and bracelets which are a pirate's favorite items of course. You know they do love the loot and wear as much of it as they can. I grabbed our jewelry box and sorted through the largest pieces with gold, silver and colored stones. Large hoop earrings are a must. A ring on every finger is another must. If you think you have enough, find some more bling and put it on! If you wear a long coat, you can hang some chains and pins from the coat. Hopefully you have a leather belt with a very large belt buckle. More than one belt of different lengths is even better. My sister joined us a couple years ago at a Halloween Party and made a "loot bag" out of a square gold table napkin, ribbon and filled it with lots of costume jewelry such as beads and pearls. She tacked some hanging out from the bag so everyone knew it was her gems and riches that she "acquired" from a treasure chest. It is SO fun to dress up like a pirate. The ideas are endless! 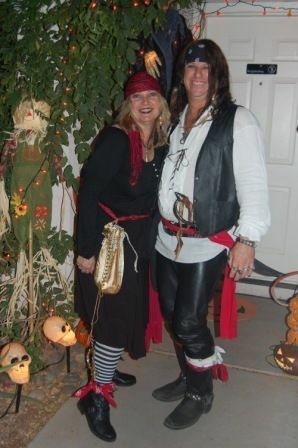 Share Your Pirate Costume Ideas With Us!